If you are wondering why this Australian made product costs so much less than other similar size units, than the answer is that this. If you are wondering why this Australian made product costs so much less than other similar size units, than here is the answer. It is particularly designed to be placed against walls, and it does not have a back wall. That is an awesome way to save big if you are placing your shed against the wall of your house or your fence and you don’t need a rear wall. We’re so pleased to be able to offer the 'Off The Wall' units as we were asked about this so often. You also save time with the installation - there is one less wall to assemble. Wall anchors are included with the product and there is no concrete slab required. Let us know if you have any questions about this or any of our other products. Product comes with 20 year warranty. Can this off the wall shed be made 2.0m wide? Hello there, it's can't be made as 2.0m. We only supply pre designed and pre engineered sheds and we can't do any modifications to it. I want to install my shed against an existing shed which is Colorbond Wilderness. What is the closest colour? 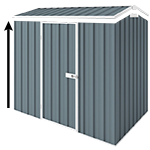 Hello there, We have the Spanbilt range sheds with a rivergum colour that is closest to the exisiting shed colour you have. Please check this link http://www.cheapsheds.com.au/garden-sheds/spanbilt-sheds.html.